Technical and Adaptive Change: This concept is drawn from some of Linsky's other work. There are, according to Linsky, two types of change. (p. 60) Technical change is relatively simple. It involves straightforward modifications of a routine behavior, or the shift in a pattern of activity. Adaptive change is much, much harder. It requires a group to critically reassess a core value in the context of a changed environment, or resolve a conflict between two deeply held values. As I read it, engaging in technical change is the work of managers. Adaptive change is the work of leaders. Let's take an example from my own ministry context. Over the last several years, as the church has transitioned to being a primarily Asian American young adult ministry, it has struggled with stagnant attendance. A variety of changes were proposed to increase attendance. A deeper focus on contemporary praise music was suggested and implemented. A shift in worship time was suggested to make the service more accessible to young adults. Both of these changes were well intentioned, and not bad ideas, but both were technical. Neither had any discernable impact. As congregational leadership has worked through a critical assessment of both vision and mission, they are coming to realize that the core "block" on growth isn't technical. It's woven into the culture of the church. My congregation, while young, is a tightly knit group of old friends, who have known each other for most of their lives. They are a family. And like most family churches, they struggle to integrate new people into their fellowship. The intimacy they share is a powerful bond and blessing. But it is also a powerful inhibitor, one that stands in the way of becoming the ministry they yearn to be. That necessary but wrenching change will not come easily. The Value of Crisis: Much of the challenge of transforming a congregation comes from the human tendency towards comfort. We like to be comfortable, to settle in to the place where we are. That desire to remain within the familiar leads to an oddly ferocious complacency, as we hold fast to patterns of life and being that both reinforce our collective identity and trap us in a single state of being. We cling to those patterns even in the face of seemingly obvious decline. 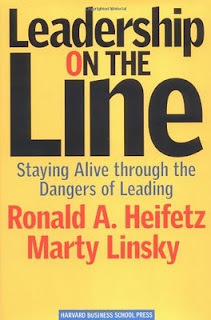 What shatters that complacency, as Heifetz and Linsky note, is crisis (p.151). When a community is forced to recognize that it is facing an existential threat, that creates a sense of urgency. That urgency, if effectively tapped, be a source for addressing adaptive change. When I began my ministry, my church was clearly in crisis. It was tiny and aging out, and knew it. Absent something radically different, the congregation had no shot at survival. From within that inescapable crisis context, it was clear that the community was ready to make the radical changes necessary to give a fighting chance at survival. That meant really empowering a new group of members. That meant letting go of some prized elements in worship. That meant, on a fairly essential level, admitting that the old church was no more, and allowing a new one to take it's place. As I prepare to move on from my congregation in October, some of the rationale for my departure lies in the need for the new, revitalizing congregation to experience urgency and crisis again. Things were growing dangerously and falsely comfortable. Endowments have a way of doing that to churches, even young adult driven churches. Though I love the folks in my ministry, there was the need to turn up the heat (p. 107-108), and it was clear that in the absence of a major and visible change, stagnation would consume it. Given the family dynamics of the new community, and my inability to break out of the marginal position too frequently inhabited by formal leadership in family-sized congregations, the only constructive disruption I could offer the church was the opportunity/threat that will come with an intentional transition. The Importance of Sanctuary and Self Care: Linsky and Heifetz's central theme is the inherent danger of leadership. Leaders, particularly those who challenge the norms of a community, are often marginalized, attacked, or subverted. Things can get deeply and personally unpleasant, and that unpleasantness can compromise the capacity of an individual to effectively discern the needs of a community. They can fall into depression, or become complacent and coopted in systemic dysfunction, or become enmeshed in destructive factionalization within their community, or let the stressors drive them into self-destructive behaviors. Much of the last section of the book is dedicated to the need for leaders to maintain a sense of identity outside of their role as leader. (p. 187) When the inevitable turbulence churns the organizational waters, a leader whose identity is wholly defined by their role and who has no other anchor will be shaken both emotionally and spiritually. It seems odd to say that a pastor needs a sanctuary (p. 204-205) outside of the church, but if they are to be an effective leader, they do. If your life is a monoculture, it is far more vulnerable in times of change. That sanctuary can take many forms (ibid), but in my own experience, much of it has been in my extra-congregational roles as father, and as husband. I've intentionally set aside space for these vital things. I read, both to deepen my knowledge, enrich my faith and just plain ol' lose myself in a good story. I pray on my own, through various forms of meditation, or in silence or in song. I blog about whatever my muse demands. I hit the gym regularly, and enjoy feeling strong. I dominate noobs in Battlefield Bad Company Two. I sit and listen to music and daydream, and listen to the howl of my bike's inline four when I wind it out. I enjoy a good IPA and the company of friends both old and new. Those safe and sanctuary places are essential if a leader is to remain healthily engaged with their community.